Too many of us are too busy to be healthy–not because we lack awareness. It’s finding the time to do it that’s the problem. In an age of 24/7 connectivity, time feels more pressed than ever. Yet, it may be that the very technology allowing us this around-the-clock connection can transform how we manage our health. Health care is a personal issue that has become wholly public–as the national debate over reforming our system makes painfully clear. But what’s often lost in the gun-toting Town Hall debates about the issue is a clear vision about how medicine could work in the future. In this feature article, frog design uses its people-centered design discipline to show how elegant health and life science technology solutions will one day become a natural part of our behavior and lifestyle. What you see here is the result of frog’s ongoing collaboration with health-care providers, insurers, employers, consumers, governments, and technology companies. You can join the conversation too: this Thursday October 8 at noon eastern, frog will hold a discussion about the future of health care on Twitter (follow the hash tag #futureofhealthcare). You can also download a .pdf version of this article from the last page. – Noah Robischon, editor. Susan’s life is full. That’s a nice way of saying that she is frenetically, overwhelmingly busy–too busy, she sometimes jokes, to be healthy. She has a husband and two small children, a full-time job, and aging parents who rely on her for support. She also has two younger brothers and a community of friends both near and far that she keeps in touch with mostly online. At 39, Susan finds herself at the center of managing the health and wellness of her young family, her parents, and herself. While numerous tools on the market can help Susan do this, few are connected, the information they provide is confusing, and they’re often so difficult to use that they cost her time–time she doesn’t have. Susan is not alone. Too many of us are too busy to be healthy–not because we lack awareness. We know what we need to do. It’s finding the time to do it that’s the problem. In an age of 24/7 connectivity that requires our near-constant vigilance, time feels more pressed than ever. Yet, it may be that the very technology allowing us this around-the-clock connection can transform how we manage our health. In this outlook, we illustrate trends in networked devices and social networking platforms to project a future where Susan can tend to her family’s varying health needs while still having time for herself. may trigger the need for an office visit. Wireless monitoring and communication devices are becoming a part of our everyday lives. Integrated into our daily activities, these devices unobtrusively collect information for us. For example, instead of doing an annual health checkup (i.e. cardiac risk assessment), near real-time health data access can be used to provide rolling assessments and alert patients of changes to their health risk based on biometrics assessment and monitoring (blood pressure, weight, sleep etc). 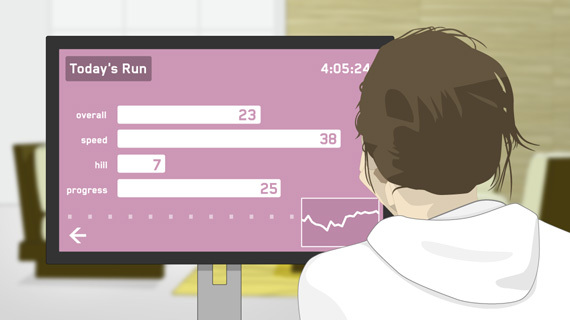 With predictive health analytics, health information intelligence, and data visualization, major risks or abnormalities can be detected and sent to the doctor, possibly preempting complications such as stroke, heart attack, or kidney disease. Wireless scales and activity monitors gather information about our health and behaviors and feed seamlessly into desktop software, Web applications, and social networks. While much work remains to be done to connect these devices and the data they generate in universal and interchangeable ways, there are standards evolving to ensure that the data will speak the same language, that the algorithms, analytics, and data output are validated, and that the collective potential of these devices will paint a truly holistic picture. Similarly, increasing adoption of open identification and authentication standards are early indicators of a truly portable and accessible social interchange upon which a secured personal health-care network can emerge. Users like Susan will depend on governed levels of access to protect their privacy while leveraging the support and power of many to manage their family’s health. Susan’s father is forgetting things, the kind of forgetting that Susan can no longer chalk up to “just being dad.” Susan’s parents still live in the house where she grew up, but many of their friends have moved away. Susan herself has moved a few hours away, so it’s hard for her to visit her parents often. 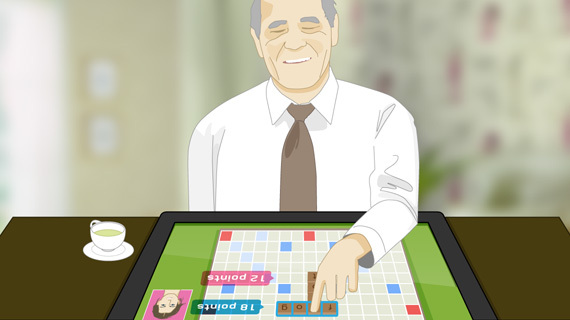 She learned that initial memory loss can be slowed through mental stimulation, so she began scheduling a weekly “virtual Scrabble” date with her dad to help keep his mind challenged and acute. 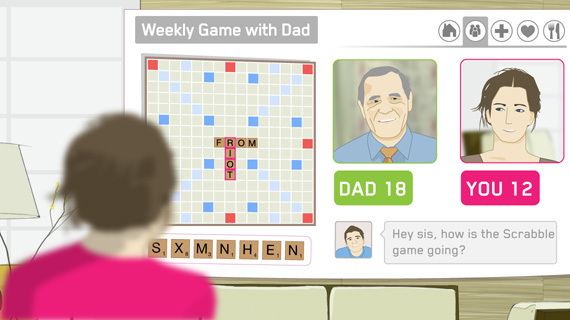 She bought her dad a physical Scrabble set with wireless sensors and low-power e-ink displays, and they use the same connected TV that enables video calls. It’s almost as if they are playing in the same room. The games make her dad laugh, and he can see her kids as they jump around and say hello. 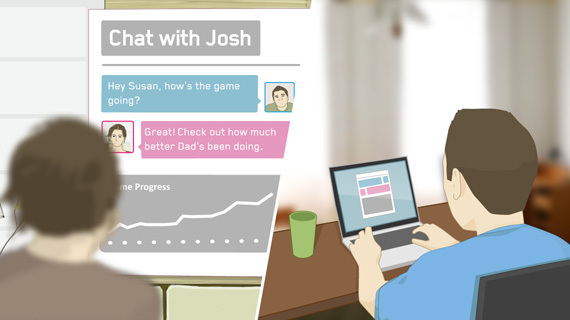 After the game, Susan catches up with him and her mom about how they are feeling and what they are doing. Sometimes, she learns more from what she sees in their appearance or expressions than from what they say. Susan and her parents are socially engaged in ways that researchers may not have even imagined a decade ago. Research has shown that greater social engagement helps people live longer, healthier lives. More studies are needed to determine the health benefits of “virtual” social engagement, but based on myriad studies pointing to improved health outcomes for people with larger social communities, it is plausible that social engagement of any kind–even the virtual kind–is better than isolation. With the advent of social networking and video conferencing, we can now stay in touch with more people, including strangers who share a common interest or illness. As we age, these connections are increasingly important to our mental, emotional, and physical well being. This social engagement and active monitoring provides Susan some peace of mind and helps her and her parents remain independent for longer. 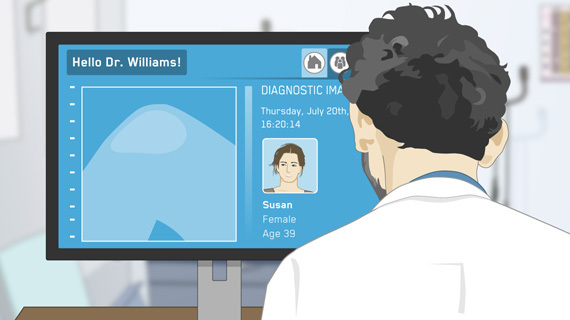 Products such as GE’s Quiet Care and Intel’s Health Guide monitor and connect people and provide a way to remotely manage their care. They also provide a way to save time and money by reducing office visits and avoiding costly emergencies. Even when we do our best to stay healthy, we still get sick. Coping with sickness in our already hectic lives can be challenging. In addition to looking out for her parents, Susan manages the health of her two kids, her husband, and herself, and she looks for ways to save time and money while still getting the care that they need. 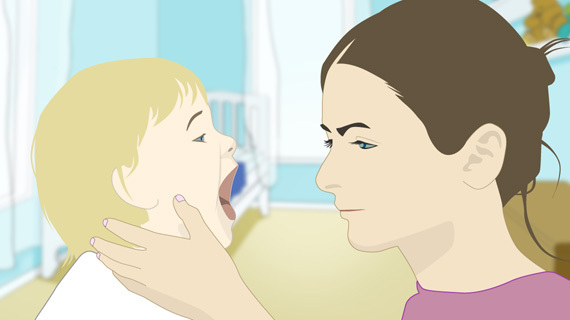 Recently, for example, Susan’s son woke up with a sore throat and a fever. She used an at-home strep test to rub a swab of her son’s throat culture onto a card. Within minutes, the test results confirmed her son had strep. Through an embedded RFID sensor within the card, the test results were wirelessly transmitted to her computer’s reader. On her computer, she was prompted to connect the incoming test results to her son’s personal health record. Next, she used her personal health network to book the earliest visit for her son within a 10-mile vicinity. Susan elected to electronically send her son’s strep results in advance of her appointment, allowing the receiving retail clinic to accelerate her visit by pre-issuing an e-prescription. Before leaving her computer, Susan selected her son’s classroom network, comprised of his teacher and the parents of other students, and sent out a message that her son had strep throat and would be home for the next several days. After Susan and her son visited the clinic she picked up her son’s prescription. While she was there, Susan purchased a quick knee scan guided by the on-site nurse, because her knee has been bothering her. She opted to authenticate and connect the results automatically to her personal health record. 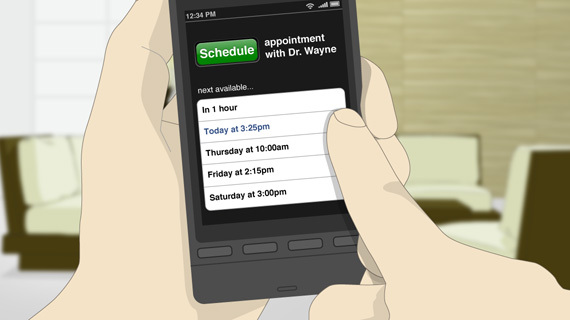 calendar availability, Susan could have scheduled an appointment with of a local family doctor who makes house calls. The doctor would have been able to electronically respond to Susan’s inquiries about her child’s health, and the communication thread would have been stored in her child’s health-care record. A reminder for a needed immunization would have been received through her general message inbox, the appointment scheduled based on her availability and the event added to her record. The technological advancements in networked devices and personal health networks are enlarging health-care teams and changing way health care is delivered. Research and clinical studies by companies like Qualcomm and West Wireless Health, GE, and Intel, to name a few, are yielding new medical technologies in the areas of screening, monitoring, and RFID among others. These developments require substantial innovation, validation, and adoption of a standardized, security backbone that providers can trust with their patient’s data and that patients can trust to allow them consistent access to their medical histories. 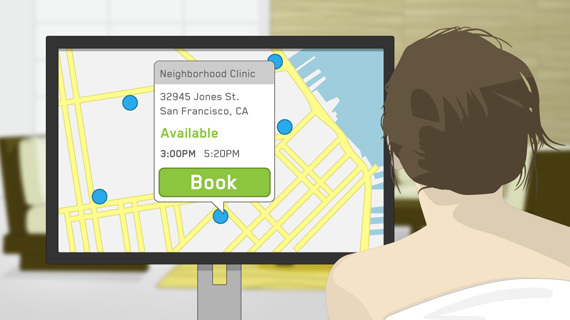 With self-diagnostics, automated schedulers, and e-prescriptions, health care will become more efficient for common maladies and will not entail hours of waiting and frustration. Retail clinics will offer flexible, cost effective, and immediate options when the family doctor is unavailable. 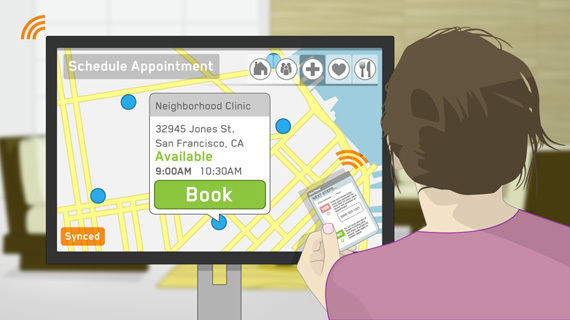 Patient results and data will stream into a consolidated health-care record that patients and health-care providers can access and view from any location. And for people like Susan, this offers more efficient access to the information and services she needs as well as potential cost savings. When Susan’s doctor first told her that she was at risk for developing melanoma, she was so frightened that she forgot everything he said as soon as she walked out of his office. When she got home, her personal health-care record was updated from the doctor’s visit with the melanoma risk information and a list of suggested resources. Susan learned about tools to help monitor her health including a Smart Mirror. 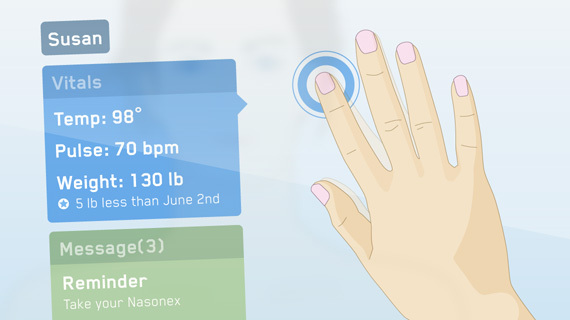 Connected to the family network through fingerprint identification, the Smart Mirror syncs to that family member’s personal health record. Every morning, Susan puts her hand on the mirror, which captures her vital signs. 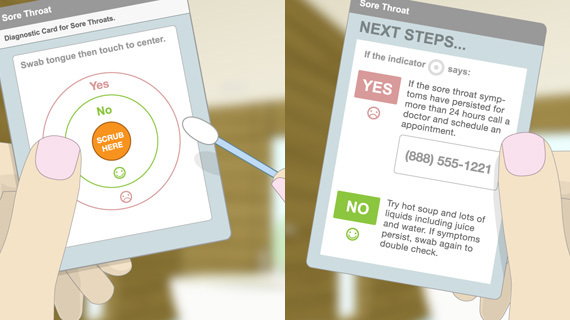 Connected to her personal health record, the mirror also reminds her of the medications she needs to take every day. Bi-weekly, she also uses the mirror to scan her skin, and any moles and other marks found are tracked for abnormal growth or color changes. The data is pushed to her protected record, from which it can be accessed and reviewed during visits with her primary care doctor and dermatologist. Trending analysis can be performed against her data, which can alert Susan and her health-care team to concerns. Swapping health-care stories among family and friends is common. This used to be done in small, local communities, and with only a few people. People with rare conditions struggled to find information about their ailments and others with the same condition. 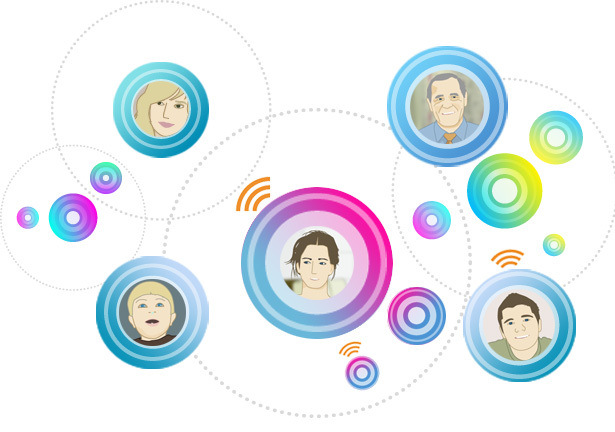 Now Susan can interact with family and friends and thousands of people across the globe, finding similarities and differences among a huge group of people. 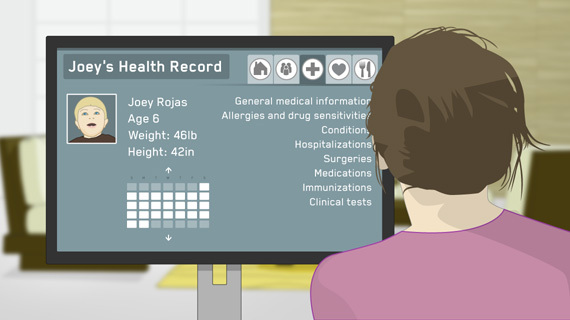 This can pose risks, but community health sites and shared personal health records offer a new frontier of medical discovery and patient support, allowing data collection and data sharing across the population. This can provide opportunities for opt-in research and trending benefits for disease prevention, monitoring, and treatments. It can also yield human-centered responses to sharing, collaborating, and finding meaning and strength in numbers. Beyond the emotional support Susan gets from sharing parts of her health record with a community of people, she is also learning about her health statistics and her habits by comparing them to those of other people. For example, because she is at risk for diabetes, she has recently started tracking her meals by taking photographs from her mobile phone and uploading them to a service that helps her measure caloric counts and nutritional values. As she evaluates her food choices and other health indicators, she compares them to those of other people of her age with similar lifestyles. She is surprised to learn that her portion sizes are much larger than those of her peers and that she eats more prepared foods than most people. With the help of her health concierge, an online personal coach that she accesses through her health plan, and others in her network, she creates a meal plan with recipes and portions to help her stay on track with her diet. 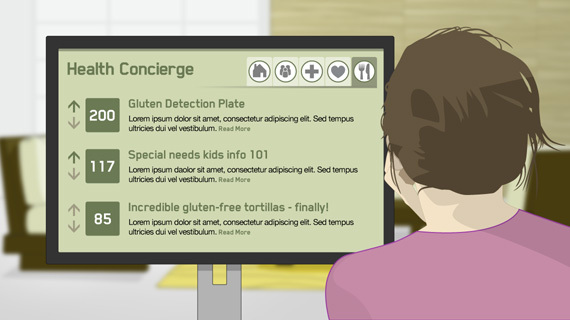 The service also provides a “shopping assistant” that helps Susan make healthy choices at the point of purchase. 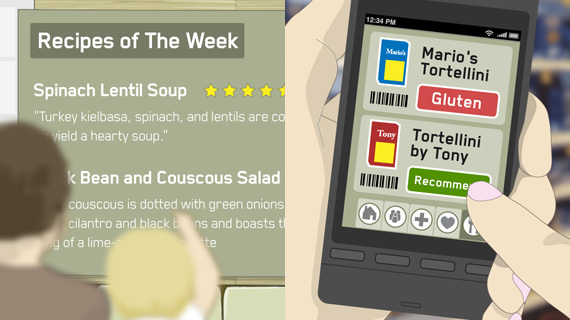 Using her phone, Susan quickly scans products to see if they fit her meal plan, and a simple “red light” or “green light” guides her selections. Beyond the value and efficiencies Susan gains from this assistance, she can also opt to have specific types of data such as her nutrition, weight, and blood pressure anonymously shared with the medical research community for research and trending analysis. The extrapolation of multiple data points across large groups of people can hasten the pace of medical discoveries and knowledge, and can also foster dialogue between scientists and patients to discern and validate emerging insights. Facilitated by technology, this exchange of information can provide relevant and personalized guidance for Susan and her family. Instead of browsing health magazines and researching online for credible and relevant information, Susan and her family can have a vast pool of information tailored to their own health conditions and coordinated with their own unique trending patterns. This saves Susan time while allowing her to be proactive and informed. After learning of her health risks from her doctor, Susan vows to pay more attention to what she eats and to get more exercise. She has set these goals for herself before as New Year’s resolutions, but she hasn’t been successful. This time, it’s different. She has easy-to-use tools that help her track, share, and compare her progress with a wide community of people. Although she never imagined it could happen, Susan has become addicted to morning jogs. It’s her time to relax, to listen to music, and to recharge. She especially enjoys jogging with her friend twice a week and catching up. Though her friend lives out of state, the two use their mobile devices and sensors to keep real-time pace with each other, listen to the same songs, and even chat when they’re not out of breath. After her jog, Susan’s mobile device guides her to do appropriate stretches based on her personal profile, including the knee-scan results recently sent from the clinic. 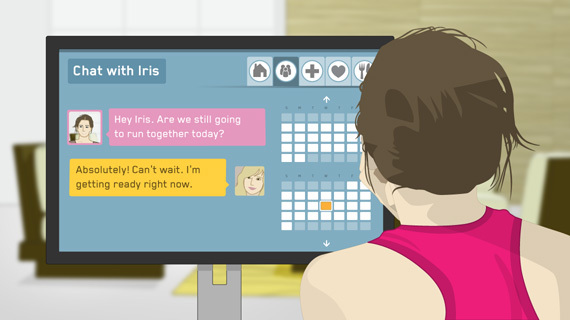 Knowing that she is running with a friend, even virtually, helps Susan get out the door to do it. And knowing that she is tracking her progress, pace, and distance without any effort on her part, Susan feels motivated to stay with her routine and try harder. She loves the encouragement she gets from her friends and from observing their progress as they work towards their goals. The tools and technology may be new, but the natural instinct to respond more strongly when you are being observed is not. Studies have long shown that people change their behavior simply because they are being observed. This is based on both a desire for reward as well as fear of punishment. We have seen evidence of this in the huge success of Nike+, with its sensors and online community of runners. Another example is FitBit, which tracks activity and sleep and offers the ability to share collaborative fitness goals with friends, family, and co-workers. 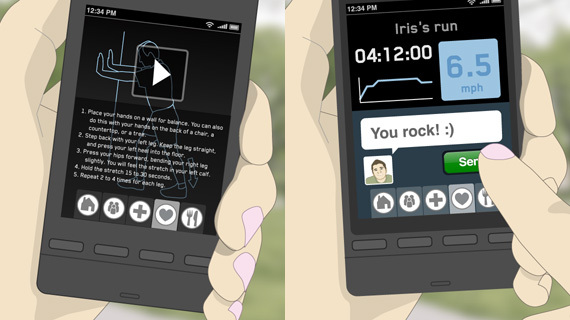 Connecting these monitoring devices to communities of people offers social support, peer pressure, and competition to encourage people to change their behavior. As the “family health manager” for her parents, children, husband, and herself, Susan plays a central role in managing the health choices, budgets, and care of her family. Today, this involves a considerable amount of time and expense in dealing with disparate systems, various health plans, different geographic locations, and incomplete information. In the future, Susan will be able to manage much of this from her home and mobile phone–a convenience that not only saves her time and money, but also gives her peace of mind. With the wireless monitoring devices and community networks, she will have access to more tailored and complete information to assist her in making the best health and financial choices. Ongoing management and awareness also helps prevent costly, time consuming, and perhaps life-threatening emergencies for her and her family. independent, healthier lives. They are converging to create a new frontier in health care. 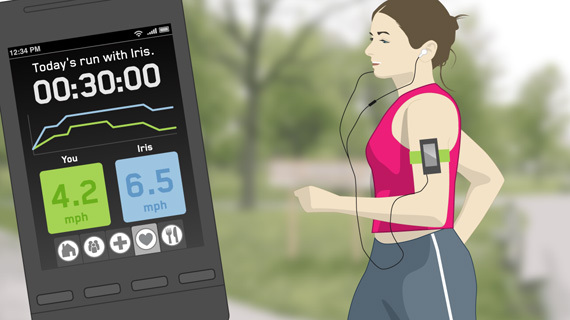 Collecting health data from mobile applications, embedded sensors, or other devices offers convenient and personalized information to help people manage their health over time. With clinically based algorithms, data visualization, and community sharing, we will receive not just more information, but more meaningful and timely information that is channeled better to improve our health. • Infographic of the Day: How Bad Is U.S. Health Care?